The Argentine fleet returned to its base after the initial landing on 2 April, its welcome as the force which had regained the islands somewhat muted by the United Nations resolution calling for a withdrawal and the news that the British were dispatching a task force. There would be nothing much that the Argentine Navy could do for at least two weeks until the British task force arrived, so all ships were replenished, and their mechanical defects were repaired. The British Government declared that a ‘Maritime Exclusion Zone’ would exist within the area 200 nautical miles from the centre of the Falklands; any Argentine ships attempting to enter that zone after 12 April were likely to be attacked. This move, which was to have such a weakening effect on the Argentine build-up, was made possible by the British possession of nuclear-powered submarines with their almost unlimited underwater endurance. Two of these vessels, Spartan and Splendid, had actually sailed for the South Atlantic on 1 April, as soon as the British realized that an Argentine force was about to land in the Falklands. The British press even suggested that a third submarine was already in the South Atlantic at the beginning of April, but this was an error, albeit a source of Argentine anxiety. Spartan and Splendid were both on station by 12 April, when the Maritime Exclusion Zone came into effect. What the Argentines did not know was that the British submarine commanders had not yet received permission to attack ships, because of the hope that negotiations to persuade the Argentines to withdraw from the islands might still succeed. The Maritime Exclusion Zone was, therefore, largely a bluff at this stage, but the Argentine leaders could not rely upon this. The Falklands could not be supplied by air alone, and what might be called the Argentine ‘blockade-running’ operation can be split into three phases. Four ships were sailed before the Maritime Exclusion Zone came into effect. The Rio Cincel and the Lago Argentino, both loaded with air force stores, were able to deliver their cargoes and return to the mainland before 12 April. The Cabo San Antonio and the Bahía Buen Suceso, carrying mainly naval stores, vehicles and equipment for the marine units ashore, reached Stanley just before 12 April. Cabo San Antonio was actually in the periscope sights of the submarine Spartan on four consecutive days when she was anchored in the approaches to Stanley Harbour. But Spartan did not attack, and this ship later returned safely to the mainland. The Bahía Buen Suceso was kept at Stanley, firstly to make use of her accommodation and later to distribute stores around the island garrisons. But the introduction of the Maritime Exclusion Zone caught four other ships still in mainland ports. These were the Formosa, loaded with army rations and with X Brigade’s heavy equipment, the Rio Carcaraña with army weapons and stores, the Ciudad de Córdoba with III Brigade’s equipment, and the Isla de los Estados also with army stores. The junta decided to suspend the sailings of these ships. It reasoned that if any of them were sunk then there would be criticism in Argentina over the loss, and that if the ships arrived and the news became known in Britain that the garrison had been so heavily resupplied then it would become harder to get a favourable response from Britain in the current negotiations. 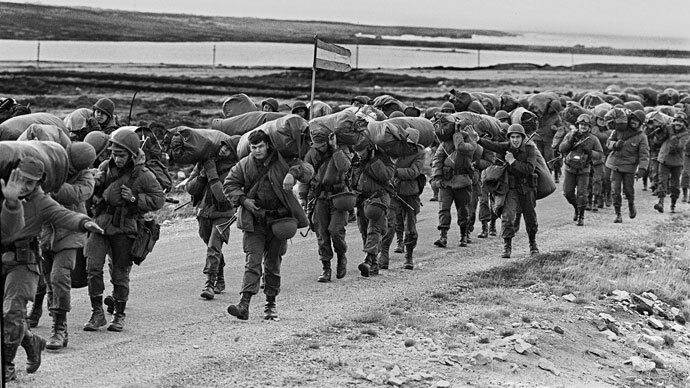 The army commanders in the Falklands were, however, desperate to have their supplies, particularly of food; the level of reserves was down to forty-eight hours at one stage, and the scale of ration issues had to be reduced. So the junta reluctantly authorized the sailing of the four ships. They were sailed independently and unescorted, it being correctly assumed that the British would not attack unarmed, solitary merchant ships while negotiations continued. The Formosa sailed first and reached Stanley safely, bringing the food reserves up to fifteen days, but this was reduced by half when the units of III Brigade were sent over by air soon afterwards. III Brigade’s equipment, in the Ciudad de Córdoba, never arrived; this ship struck a rock soon after sailing and had to return to the mainland. The Río Carcaraña and the Isla de los Estados sailed later and both managed to reach Stanley before hostilities commenced, but they were not able to unload quickly and would be trapped in the islands. I had volunteered my services on 2 April, asking if I could do anything to help in the Malvinas. I was called to the head office by the Operations Manager on 13 April. I didn’t think that the army could keep up its logistic effort without ships, and ELMA’s help would be needed. I knew the private shipowners would not be very keen. I was asked if I was still willing to go. Looking back on it, I think I made a big mistake, but there was no turning back. I was ordered to take over the Rio Carcaraña, which had been laid up for nearly a year; they had thought that its useful life was over. I had to prepare the ship for operations; we had her seaworthy in forty-eight hours. There was a lot of indecision over what we were going to do. I went to Navy Headquarters several times but kept coming back without orders. Then on the 19th, there was a big commotion, and I was ordered to be ready to sail that night. I had no crew at that time, and the ship was not loaded. We got a crew, moved berth and loaded on the 20th. There were lorries, much fuel in drums – jet fuel, diesel, etc. — and containers, at least one of which was full of television sets for the kelpers; as an Argentine, I could not understand that one. There was also 200 tons of fresh food as frozen cargo; the army in the Malvinas thought that food was the most welcome part of the cargo. We sailed on the 22nd. I was ordered to keep my mouth shut about the destination, not even being able to tell the crew, but the whole port of Buenos Aires knew we were loading for the Malvinas. We made a good voyage, and I cheated the British Navy in their Exclusion Zone by sailing down to the deep south and approaching the islands from due west. I made landfall on the little Isla Pájaro — what you call Bird Island; I think the naval liaison officer was impressed with our navigation. We came into Puerto Argentino – Stanley – on the 26th. I don’t think they were expecting us because a reception committee of four navy jets met us on the way in. They circled round us for several minutes; I could see they were armed to the teeth. The flight leader eventually identified the colours on my funnel as belonging to ELMA and knew we were friendly. I am pleased they were navy pilots; the air force might have been more trigger-happy. Then we were met by a Coast Guard ship which handed over on a long pole a very rough chart of the local minefields. We came in very close to the coast, between the land and the minefields, and anchored in the outer harbour. I was surprised to see the Formosa, another ELMA ship, there. I reported to the navy: ‘Well, here we are. It’s all yours.’ The very first thing they wanted off was that container of television sets for the kelpers. I thought that was disgusting; the army needed ammunition and food far more urgently than the kelpers needed those television sets, but it was a political decision. Those television sets were part of the ‘hearts and minds’ policy by which the Argentine administration hoped to win over the Falklands civilians. Two hours of transmission were relayed each evening from the mainland. There was an interesting sequel. The sets were sold on generous hire-purchase terms, but the war ended, and the Argentines departed, leaving the civilian buyers with the sets after paying only two monthly instalments – but only able to play video recordings. An ‘air bridge’ had been put into operation when the Maritime Exclusion Zone came into being. A major effort was made using C-130 Hercules and Fokker F28s of the Argentine Air Force, Lockheed Electras and F-28s of the Navy, Boeing 737s of Aerolíneas Argentinas and BAC 111s of the internal airline Austral. When that first air bridge closed in the evening of 29 April, just before the British task force arrived, more than five hundred successful flights had been made to Stanley, bringing in approximately 10,700 men and 5,500 tons of cargo, mainly ammunition and weapons. But this means of supply could not satisfy the garrison’s entire needs, and the units in the Falklands would be left with grave shortages of food and many items of equipment. 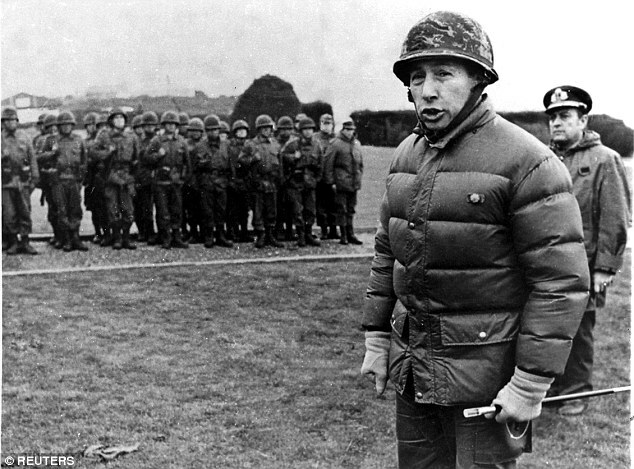 The Argentine high command overestimated the ability of the British to reach the Falklands with a force capable of making a landing on the islands. The British ships and military units had been dispatched in haphazard fashion, with big public displays being given to some departures while others were in secret. The British policy over this was twofold, firstly hoping to persuade the Argentines to withdraw from the islands by a public display of strength and determination, secondly to confuse the Argentines over the exact composition of the task force. The first aim was not achieved, but the second one was. The next British moves were determined by two factors. An early success was desirable, to sustain support at home and to put further pressure on Argentina to conform to the United Nations resolution to withdraw, but no major landing would be possible in the Falklands until the equipment of the landing units had been sorted and restowed at Ascension Island after being loaded so haphazardly in the rush to sail from Britain. South Georgia, with its small Argentine garrison, was chosen for the early success needed. The British task force thus split into three parts. Most of the British warships were pushed on to the Falklands to carry out preliminary operations there. The main landing ships and military units remained at Ascension to sort out their equipment and to await a further reinforcement – a parachute battalion whose ship would not reach Ascension until 7 May. A small force of ships containing troops made for South Georgia. The Argentine Navy was responsible for South Georgia, with Admiral Anaya taking personal control. His intentions for the area went through several phases. Initially, he wanted to set up a scientific station as a practical example of Argentine sovereignty, but this idea was overtaken by military events. When news arrived that British ships were approaching South Georgia, Anaya’s first reaction was to write off the place as untenable and order his men there to give up without a fight. But Anaya changed his mind again and dispatched a reinforcement of a composite marine platoon of about forty men under Lieutenant-Commander Luis Lagos aboard the submarine Santa Fé, with orders to make a stand if attacked but then to surrender if the British proved to be in overwhelming strength. In this way Anaya hoped that an easy recapture of South Georgia would satisfy British honour and that the British would not proceed with operations against the Falklands. 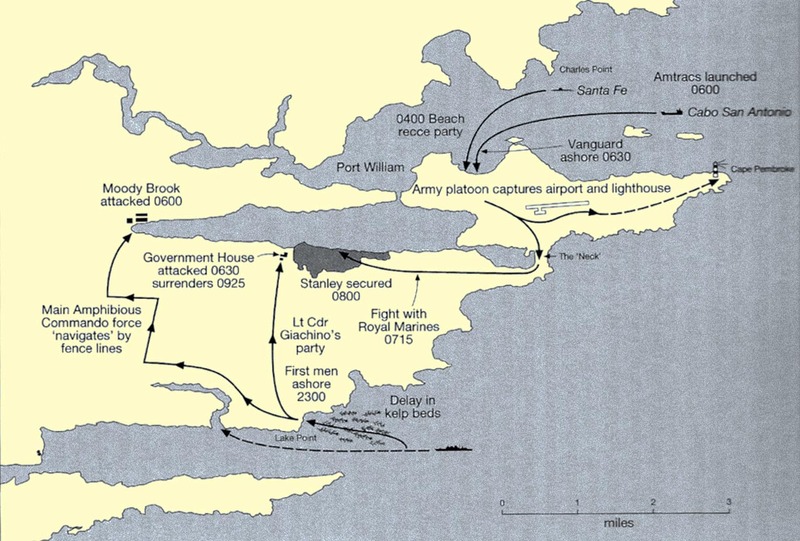 The British attacked, being successful because of exactly the same factors as had been available to the Argentine attackers earlier in the month, the gunfire support of warships and the availability of helicopters, although the British lost two helicopters early in the operation when they crashed in a snowstorm. No one was killed in the fighting on South Georgia, but a crewman from the Santa Fé was badly wounded when the submarine was attacked by British helicopters, and another man in its crew was tragically killed by his Royal Marine guard after the submarine was captured when the guard thought that the Argentine sailor was trying to scuttle the submarine. Petty Officer Quartermaster Félix Artuso thus became the first fatal casualty in Argentina’s attempts to hold the places taken from the British earlier in April. The brief action in South Georgia ended on 26 April. Argentina’s presence here lasted just twenty-three days. The British took 180 prisoners in South Georgia, a figure which includes Sr Davidoff’s hapless scrap-metal workers, the various marine parties and the crew of the Santa Fé, which was damaged and beached, the first ship lost to Argentina in the war. The prisoners were soon returned to Argentina, via the Uruguayan city of Montevideo, which would act as a neutral exchange point for many more men later in the war. Only one prisoner was not immediately returned. Lieutenant Astiz was taken to Britain to be questioned about several foreign people who had disappeared in Argentina in the 1970s, but the British respected his status as a prisoner of war, refused to hand him over to other governments and returned him to Argentina later in the year. The fall of South Georgia marked the start of a massive distortion of events by the junta. Official communiques described a prolonged and heroic defence against overwhelming British forces, with commando parties dispersing into the wilderness and holding out long after the main fighting ended — the last part of which was completely untrue. The senior Argentine officer ashore, Lieutenant-Commander Lagos, was court-martialled in 1983 ‘for contravening Argentina’s military code by surrendering without having exhausted his ammunition and without three-quarters of his men becoming casualties’. Vice-Admiral Lombardo attended the court martial and testified as to the exact nature of the orders issued, and this enabled the officer to be acquitted. Sr Davidoff’s scrap metal remained uncollected, and after the war he was not able to obtain a refund of his payment to the owners. As the last days of April passed, the Argentines made their final preparations to meet the British. Their fleet had sailed and was exercising hard, but only in shallow coastal waters which British submarines could not enter. Air force and naval aircraft had been extensively practising attacks on ships. Most of the air units were now deployed to makeshift bases in the south of Argentina from where they would be within range of the Falklands. A few ships had to go into port again after the hard exercises but these soon returned to sea, and the entire surface navy stood ready for action. It was still believed that the support ships seen with the British task force were carrying landing units. The only warship sent into the exclusion zone around the Falklands was the submarine San Luis, which sailed from Mar del Plata on 11 April. After two days spent exercising and testing its equipment, the submarine reached the edge of the zone on 17 April and was ordered to remain just outside it while negotiations were still taking place; the Argentine ships were ordered not to fire the first shots. Then, after the loss of South Georgia, the San Luis was ordered into the zone and it reached its patrol area north of Stanley on 29 April. The British commanders were apprehensive about the dangers posed by Argentina’s submarine force, but the San Luis would be the only one to operate. Her sister ship Salta was not allowed to sail because a defective propeller shaft caused too much noise which would have attracted attack. The older Santa Fé was put out of action in South Georgia, and her sister ship the Santiago del Estero was not even able to submerge; she sailed from her base at Mar del Plata, in the hope that the British would believe her to be at sea, but was hidden in Bahia Blanca harbour for the remainder of the war. Two modern submarines of German design, the Santa Cruz and the San Juan, were still under construction and could not be made ready, although the British did not know that. The Argentines received the final confirmation that the British task force was about to reach the Falklands area when it was spotted and reported on 29 April. The report came from the Narwal, which was one of several deep-sea fighting trawlers with naval officers aboard which, under orders from Naval Intelligence, were looking out for the British task force. Narwal gave particularly good service, spotting and reporting the task force on this day and making contact again later. In announcing the establishment of a Maritime Exclusion Zone around the Falkland Islands, Her Majesty’s Government made it clear that this measure was without prejudice to the right of the United Kingdom to take whatever additional measures may be needed in the exercise of its right of self-defence under Article 51 of the United Nations Charter. In this connection Her Majesty’s Government now wishes to make clear that any approach on the part of Argentine warships, including submarines, naval auxiliaries or military aircraft, which could amount to a threat to interfere with the mission of British Forces in the South Atlantic will encounter the appropriate response. All Argentine aircraft, including civil aircraft engaging in surveillance of these British forces, will be regarded as hostile and are liable to be dealt with accordingly. The main implication of this warning for the action about to commence was that any ship or aircraft approaching the exclusion zone might now be attacked if it was considered a threat to British units. When asked Vice-Admiral Lombardo said, if in the light of the later sinking of the General Belgrano just outside the exclusion zone, he fully understood the intent of the message. He answered, without any hesitation or qualification, that he and his colleagues realized the implications of the note. He went on to say that his first thought was that the British would use the new conditions to attack the mainland air base at Rio Grande to neutralize the Exocet-equipped Super Étendard aircraft there, and he sent four battalions of marine infantry to that area and asked the army to provide an anti-aircraft unit. The fear that the British might land special forces to attack the mainland air bases led to a tragedy on 30 April. A Huey helicopter of the army’s 601st Combat Aviation Battalion was searching the coastline near the Comodoro Rivadavia air base, following a report that men had landed from the sea, when it crashed in mist and early-morning darkness. All eleven men on board were killed – the three-man helicopter crew, together with two officers and six soldiers from the staff of a military college. One of the officers was Colonel Clodoveo Arévalo, who would be the most senior-ranking Argentine serviceman to die in the war. Yugoslav army experts check the wreckage of the downed American F-117 aircraft, in the village of Budjanovci, 30 miles northwest of Belgrade. While Deny Flight and Deliberate Force showed the growing gap between American training and other allies’ preparation, Allied Force demonstrated the transformation that had occurred in the air force’s combat search and rescue (CSAR) mission set. Allied Force began as a means to force President Slobodan Milošević to stop the ethnic cleansing he had ordered in Kosovo. Allied Force provided examples that Red Flag still worked, especially when it came to the ability to rescue pilots from hostile environments. It also demonstrated that the CAS exercises known as Air Warrior and the advanced training received at the Fighter Weapons School provided important experience as well. The CSAR missions were conducted by air force special operators known as pararescue jumpers. These missions had been practiced at Nellis AFB from the earliest days of Red Flag. More than any other mission type, the training conducted to pick up a downed pilot in hostile territory was tested during Allied Force. The training proved worth it. The realistic training exercises of Red Flag and Air Warrior used A-10s and rotary wing assets to rescue downed personnel. Between 1980 and 1990, the annual CAS Red Flag and the block on command and control taught at the A-10 weapons school changed the way the air force conducted rescue operations. Never before had air force personnel and assets been able to conduct a rescue operation in such a highly contested threat environment as the one found in Serbia. The bombing of Serbia provided another useful example of how differences between strategic and tactical no longer mattered and how the training practiced at Red Flag was very close to combat operations. F-117s flying early in the conflict struck underground command and control bunkers, military barracks, radio relay stations, and other targets that served both strategic and tactical significance. Each target, regardless of its nature, was just something that needed to be destroyed or disabled, and each operation moved NATO closer to ending the campaign. The B-2 bomber also saw its first combat missions during Allied Force, flying from its home station in Missouri and returning there rather than be stationed overseas. The B-2 had entered into Red Flag exercises in the summer of 1995, participating in a second Red Flag a few months later. The air force deployed the B-2 to Red Flag events more often than other fighter squadrons in its earliest days to ensure it was prepared to enter actual combat, which it did in 1999. Still, this was not a return to the days of strategic bombardment. The bombers now fell under Air Combat Command and executed deep strikes against targets. What mattered was a target’s destruction and, consistent with that objective, aircraft were assigned based solely on their ability to carry out a particular mission and not because of what command they belonged to. There is a direct link between the rescue efforts in the Balkans and those practiced at Red Flag and at the Fighter Weapons School. Exercise parameters during a search and rescue training mission anticipated the rescue of downed pilots in Serbia perfectly. More important, the rescue efforts demonstrated that realistic training was as important as the technology needed to go in and rescue a downed pilot. The combat search and rescue efforts to retrieve Dale Zelko after he was shot down by surface-to-air missiles began long before he ever took off on his mission. The search and rescue effort to save Dale Zelko, the largest such operation since the Vietnam conflict, demonstrated the importance of training over technology. One of the benefits of Red Flag proven during this particular rescue effort was the value of training with different types of aircraft. Air force pilot Lieutenant Colonel Brian McLean said in his book Joint Training for Night Air Warfare (1992) that Red Flag “exposes the participants to more than one type of aircraft, [and] the participants learn what skills and capabilities can be provided by other types of aircraft and crews.” During the search and rescue efforts, Red Flag graduates knew where each and every aircraft would be located by altitude and exactly what type of mission the pilot of that aircraft would be responsible for. Another mission taught at Red Flag that was used during this rescue effort was the ability to conduct operations at night. In the fall of 1991, after Desert Storm proved the importance of operating at night, Red Flag moved its afternoon “go” to a night “go” to train pilots in nighttime operations. Lieutenant Colonel McLean indicated that conducting operations during periods of darkness allowed pilots to coordinate their “timing to achieve a more effective overall mission package.” This effectiveness in timing proved its worth in the rescue of Lieutenant Colonel Dale Zelko. On the night of 27 March 1999, Lieutenant Colonel Zelko set out on a bombing run. He carried, in addition to the standard survival equipment, an American flag tucked under his flight suit; it had been given to him by the senior airman who’d prepared his target package that night. It has long been tradition in the air force for pilots and aircrews to carry American flags with them during missions. Zelko had just finished his run over Serbia in his F-117 when the unthinkable occurred—he saw at least two, possibly more, surface-to-air missiles closing in on his aircraft. As the first one passed extremely close to the front of his aircraft, the pilot was surprised that its proximity fuse did not engage to detonate the missile. The second exploded near the rear of his aircraft, sending it into a violent negative-G situation and forcing Zelko to eject. Colonel Ellwood Hinman, a member of Zelko’s squadron, later said, “If we had to pick one man we wanted to be in that situation, it would have been Zelko.” Zelko was the Forty-ninth Fighter Wing’s life support officer. His day-to-day job, outside of the cockpit, was to train pilots in ejection procedures and how to handle their survival equipment in the event of this very situation. Less than a minute after ejecting and floating down under his canopy, Zelko made the following radio transmission: “Mayday. Mayday. Mayday, Vega-31.” Other aircraft in the vicinity and the large NATO airborne warning and control system aircraft orbiting nearby immediately picked up the transmission and responded: “Magic-86, on guard, go ahead.” The response stopped those who received the message dead in their tracks: “Roger, Vega-31 is out of the aircraft! Downed.” The pilot of another F-117, Vega-32, captured the entire episode on his radio, including the extremely shrill locator beacon that sounded as Zelko floated down toward enemy territory. Zelko was using a short-range radio intended only for communicating with aircraft orbiting nearby, meaning that once he was downed, he had difficulty contacting the airborne warning and control system aircraft again. A nearby KC-135 refueler began relaying the messages from Zelko to the AWACS aircraft. The only aircraft whose pilot heard all of the communications between Zelko, the air refueler, and the NATO AWACS aircraft was another F-117. This stealth pilot transmitted to the AWACS aircraft to “start the [combat search and rescue] effort.” A member of the combined air and space operations center team on the combat operations floor said, “You could have heard a pin drop when we realized it was a stealth.” Immediately after the moment of stunned silence, all hell broke loose as a massive rescue operation was set in motion. Dale Zelko landed roughly five miles west of Belgrade and south of the town of Ruma; his location so close to Belgrade indicated to rescue officers that this would be a very difficult mission. Zelko’s landing site was little more than a flat farm field, meaning it would be extremely challenging for the downed pilot to find somewhere suitable to camouflage himself and wait for the rescue mission to arrive. Beyond that, he had landed within two miles of the wreckage of his aircraft and thus was in danger of being found by the Serbian Army before the American combat search and rescue team arrived. Zelko moved from his landing site into a small irrigation ditch that provided the only land cover between two plowed farm fields. Major Ellwood Hinman was scheduled to fly in the “second go” of F-117s that night. When he entered the squadron, it was, in his words, “complete chaos.” Two problems immediately greeted Hinman and every operational officer at Italy’s Aviano Air Base that evening. The first was the rescue attempt to get Zelko out of enemy territory. The second was whether to bomb the wreckage to ensure that its components did not fall into enemy hands. Hinman volunteered for the second mission. However, for two reasons, the bombing mission never took place. First, every airborne tanker was diverted to support the rescue mission. Second, the proximity to Belgrade meant that local and international news stations arrived at the crash site quickly. In fact, by the time Hinman was preparing to taxi his aircraft, CNN had already broadcast images of the F-117’s wreckage burning in a field. With dozens of civilians at the crash site, there was no way the air force could destroy the aircraft without incurring civilian casualties. While the F-117 pilots of the Eighth Fighter Squadron at Aviano Air Base struggled to decide what their next steps should be, a pilot from a nearby A-10 squadron showed up to collect as much information on the downed pilot as possible, including his “isolated personnel report,” which contained information only the downed airman would know and would be able to remember even under extreme duress. The A-10 pilot gave this information to to the first two A-10 pilots readying to take off in support of the rescue mission. The rescue of Zelko involved dozens of aircraft and demonstrated the timing and coordination during night operations that had been emphasized at Red Flag after Desert Storm as well as the importance of pilots training with types of aircraft that had differing capabilities from their own. Furthermore, because of training exercises like Red Flag and home station continuation training, each pilot knew exactly how close he or she could push his or her aircraft into the Serbian defense system. After the first launch of aircraft that night, all other missions had been cancelled due to weather, and when the F-117 was shot down, more than a dozen airborne assets were retasked to participate in the rescue. These assets included at least two airborne warning and control system aircraft (NATO and air force); three intelligence, surveillance, and reconnaissance assets; an RC-135 Rivet Joint; an RC-135 Compass Call; a U-2; an EC-130E airborne command and control center; four F-16 CJs that provided onscene command until the arrival of the A-10s; and USMC EA-6Bs, each of which provided unique capabilities to facilitate the rescue of the downed pilot. The KC-135 refuelers, which normally circled in preplanned orbits well outside of any enemy threat, pushed closer to Serbia and the threat of enemy MiGs to ensure that the A-10s, which had to refuel, were able to safely “chainsaw” back and forth to the refuelers while leaving one pair on station over Zelko. 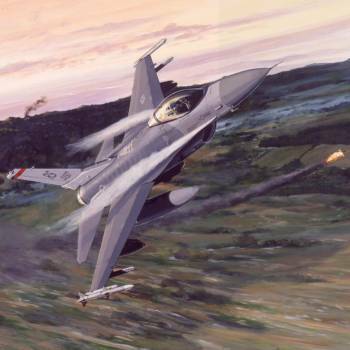 The Banja Luka incident on 28 February 1994, was an incident in which six Republika Srpska Air Force J-21 Jastreb single-seat light attack jets were engaged, and four of them shot down, by United States Air Force F-16 fighters southwest of Banja Luka, Bosnia and Herzegovina. Part of the rescue effort was the authentication of the downed pilot through the isolated personnel report information already obtained by the A-10 pilots who provided on-scene command. In the case of Zelko, an enthusiastic numismatist, it was his answer to the question of what his favorite coin was—the Mercury dime—that confirmed to the on-scene commanders that they were, in fact, dealing with the downed American pilot. As the rescue helicopters, two MH-53 Pave Lows and an MH-60 Pave Hawk, moved into the area and called, “Two miles out,” Serbian surface-to-air radars began targeting the A-10s. One of the A-10 pilots made an unusual transmission, calling, “Magnum,” the code word used by the F-16 CJ pilots to denote the firing of a high-speed antiradiation missile (HARM). The ploy worked; no sooner had the pilot made the false call than the Serbians turned off their radars. At precisely the right moment, all aircraft began the extraction. The MH-60 located the survivor and moved overhead, and the two MH-53s circled overhead in a perfect Lufbery circle, each one covering a 180-degree arc around the actual rescue helicopter. Above them, the A-10s did the same, ensuring complete 360-degree coverage over the pilot. The MH-60 Pave Hawk, call sign Gator-31, settled onto the ground, and a pararescueman jumped out for the final authentication. A mere forty seconds later, Zelko was inside the helicopter and the entire mission began the race out of enemy airspace. The members of the combat search and rescue crews later said that the rescue of Dale Zelko was the “most challenging; most intense; the most physically, mentally, emotionally exhausting peacetime or wartime mission” they had been involved in during their careers. Still, each and every pilot, whether flying a fighter, attack aircraft, or helicopter, had trained for this very particular type of mission at his or her home station and at Red Flag. True, the aircraft were all technologically advanced, but so was the F-117 that had just been shot out of the sky. The key element in success was the training. The six-hour rescue ordeal concluded on the very ramp from which Zelko had taken off earlier that night. Word spread quickly that Zelko was arriving on a C-130 at Aviano Air Base. Each member of his squadron, the A-10 pilots who led the rescue mission, and dozens of others gathered as the C-130 landed, taxied, and dropped its ramp. Zelko was greeted with raucous applause. As Hinman recalled, “The wing commander greeted him, followed by his squadron commander, and next in line was a young airman first class, Katrina Carterer. Zelko spotted her, reached inside his flight suit, and withdrew the American flag he had carried on that mission for her. With the sun rising and the Alps in the background, it was like something out of a movie.” The rescue of Vega-31 was a high point in the Kosovo air war. The rescue proved that Red Flag training scenarios for search and rescue missions were perfectly suited for real-world execution. The U.S. Air Force was transformed through the use of realistic training exercises, but this produced a gap between the capabilities of American pilots and those of other allied nations, as the experience of Allied Force clearly showed. The NATO allies were decidedly untransformed. Cesar Rodriguez opined that “one could argue that, in Allied Force, NATO was the Achilles’ heel of allied air forces when it should have [been] and needed to be the crown jewel.” Lieutenant Colonel Steven Ankerstar, who flew F-15s during Allied Force, echoed Lieutenant Colonel McLean’s thoughts on the importance of night operations, pointing out that American pilots had trained for “lights-out” night operations for decades, while this was a mission that many allies were not comfortable conducting. Allied Force demonstrated that for every action there is a reaction; the use of stealth in Desert Storm had led to other countries attempting to counteract it. Elements of the Serbian Army configured their radars to give them the best opportunity to detect the F-117. The downed F-117 also became something of a sore subject with many in the air force. The inability of the Americans to completely destroy their downed aircraft meant that certain aspects of the low-observable aircraft probably fell into enemy hands that night. If the aircraft wasn’t compromised before Allied Force, it certainly was after it. The compromise of the F-117 did not stop the air force from concluding that air power alone had delivered the ceasefire to NATO leaders. A RAND Corporation study conducted after the war yielded the book NATO’s Air War for Kosovo: A Strategic and Operational Assessment. This work went so far as to reassert that Allied Force was “the first time air forces had successfully coerced an enemy leader in the absence of significant friendly ground force involvement” and that “NATO’s bombing effort … played the determining role in bringing about Milosevic’s defeat.” These statements directly contradict the following facts. First, the air war was originally planned to last for forty-eight hours but instead lasted seventy-eight days. Second, Milošević and the Serbian military showed great resiliency against the air campaign, to the point that many NATO countries believed the only way to stop the ethnic cleansing was a massive influx of ground troops. Finally, it was only after NATO threatened to use ground troops and Russia withdrew its backing from Milošević that the latter agreed to a ceasefire. But what did operations in the Balkans say about the way the air force trained for war? The shooting down of two F-16s and the F-117 exposed no real flaw in the training paradigm. Even in an uncontested environment the occasional aircraft will be lost. Red Flag still demonstrated its merit, even at the expense of other nations’ egos. As Cesar Rodriguez noted, American pilots operated on an entirely different level, thanks in no small part to years of training for day and night missions. Blue Flag proved to be a more difficult training exercise to evaluate. Participants at Blue Flag were not instructed in how to wage a war of escalation, nor were they taught how to plan for operations led by the UN or NATO, although this undoubtedly should have been inserted into the training programs. Perhaps the biggest problem for air planners and pilots conducting operations was that there existed no training mechanism addressing how to get organizations to work together coherently in combat. Planning for and flying in Red Flag was relatively simple. Lines of authority were clear, and the “enemy” was a more or less known quantity. However, planning and executing an air campaign in which the United States was not the lead organization proved difficult to simulate in training. Another problem during the campaigns in the Balkans was the clash of personalities, also difficult to train for in an exercise environment. Whereas General Horner at least understood General Schwarzkopf during Desert Storm, there are strong indications that General Wesley Clark and his air component commander, Lieutenant General Michael Short, did not get along with each other. The importance and power of personality conflicts during military operations should not be underestimated, especially if those clashes change or compromise the use of one military arm versus another. Training and technology aside, personality conflicts between senior leaders are never productive. Moreover, there was a lack of clearly defined objectives given to allied air planners before the beginning of hostilities. This again underscores the point that, although training prior to the campaign prepared pilots for aerial combat, the training for campaign planning itself showed a need for modification. Nevertheless, there are many positive outcomes of the Balkan campaigns that can be tied directly back to air force training exercises. If one could overlook the failure to achieve NATO and UN objectives, the overall results of air power in the conflict, especially American air power, were quite impressive. In all, the Americans lost three aircraft during the conflicts. Among these, the air force lost two F-16s and one F-117. All three aircraft were lost to surface-to-air missiles and all three pilots were rescued, although in one case it took several days to accomplish the task. In return, the American military destroyed six MiG-29s and at least four J-21s and two J-22s during the Banja Luka incident. American missile technology continued to be improved as well. After Desert Storm, twenty of sixty-one kills were accomplished beyond visual range. This was due in large part to the air force’s use of the AIM-120 advanced medium-range air-to-air missile. Despite the great increase in beyond-visual-range kills, other factors showed that beyond-visual-range weapons were not nearly as effective as some claimed. Since the first use of the missile in 1992, the air force recorded ten AIM-120 kills, but four of those were not achieved beyond visual range. Furthermore, two were against nonmaneuvering, fleeing aircraft, and none of the ten downed aircraft had actively employed electronic countermeasures. In each of these situations, the United States had a numerical advantage, and none of the enemy aircraft were equipped with similar beyond-visual-range weapons. Air combat during the 1990s continued to prove the value and efficacy of Red Flag, Blue Flag, and other training exercises. In essence, training events gave American pilots the opportunity to “dry-run” a mission before actually flying it in combat. Air force pilots’ ability to plan for and execute very complicated missions in a tiny air space over the former Yugoslavia was something that they had developed in training on more than a hundred different occasions. Every Red Flag training mission and every sortie in what was called “continuation training” (the missions conducted daily at an aircraft squadron’s home station) prepared American pilots for exactly these types of missions. After 1975, the air force was transformed in the way that it trained for and executed aerial warfare. The training revolution directly led to the success of Operation Desert Storm. After Desert Storm, the air force continued to expand its training exercises, and an already existing gap in capabilities between the U.S. Air Force and allied air forces began to widen. Red Flag, Blue Flag, and other training events continued to demonstrate their utility, but air force flyers were now so far ahead of some of the other allied nations that it was difficult to conduct operations alongside them. Summer 1943 – A Limited Offensive? By early March 1943 it was evident that Germany would be able to salvage two significant assets from the wreckage of the winter. Manstein’s advance to the Donets would throw the Russians temporarily off balance in the zone of their main effort, and as a dividend of Operation BÜFFEL and the retreat in southern USSR, a fairly strong operational reserve would be created. These were enough to afford Hitler, at least to a limited degree, a free hand in planning. On 13 March the plan was ready, embodied in Operations Order 5. After the end of the winter and the spring muddy season, it stated, the Russians would return to the offensive. The German armies would have to strike first in several places and, as Army Group South was currently doing, definitely seize the initiative in at least one. The spot Hitler chose was the Kursk bulge. By mid-April Army Group South was to assemble a strong panzer army for an attack north toward Kursk from the Kharkov area. On the northern rim of the bulge Army Group Center was to create an offensive force in the Second Panzer Army zone, using divisions released by BÜFFEL. The offensive would begin as soon as the muddy season ended and before the Russians had a chance to launch an attack of their own. Army Group A would reduce the size of the GOTENKOPF, and its primary mission would be to release troops for transfer to Army Group South. Although the Kursk offensive, given the code name ZITADELLE, subsequently acquired the character of a desperate and tragic gamble, it was conceived as part of a coherent and not unpromising strategy that envisioned a series of limited offensives to consolidate the German defenses. A victory in the Kursk bulge would straighten the German front and could be expected to keep the Russians off balance a while longer. In his order Hitler instructed Army Group North to be ready to follow up ZITADELLE with an operation against Leningrad. By taking Leningrad he intended to tighten his hold on the Baltic Sea and northern Europe, where growing hostility on the part of Sweden and war weariness in Finland were adding to his long-standing concern over the vulnerable Norwegian coast. The timing was crucial. If ZITADELLE succeeded in the spring, the operation against Leningrad, using troops from ZITADELLE, could start in early summer; and once Leningrad was safely in hand, Finnish interest in the war could be expected to revive, Sweden could be dealt with at will, and Norway would become a much less attractive target for the Western Allies. If ZITADELLE were completed promptly, there would also be time and troops enough to strengthen the Mediterranean front. On the other hand, the cost of failure would run high. The two armies intended for ZITADELLE comprised the entire German strategic reserve. They were working capital which, lost or tied down in a fruitless enterprise, could not be quickly replaced. 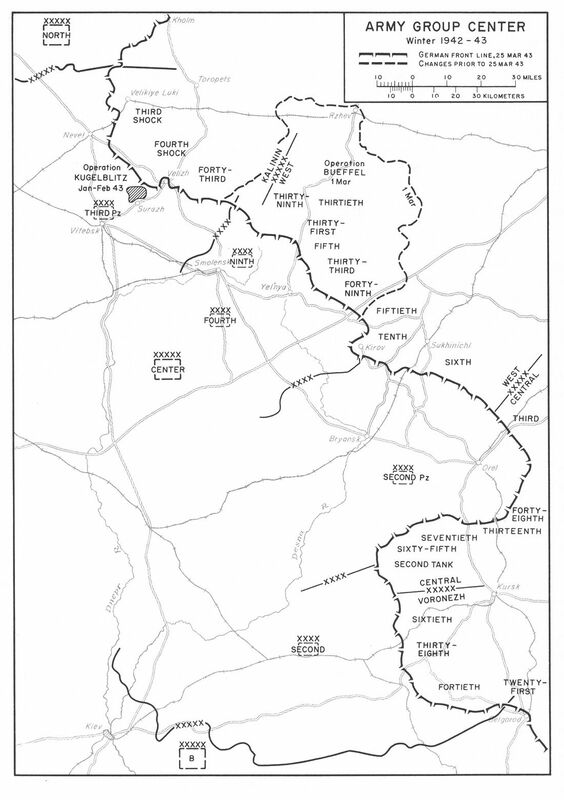 At the time Hitler issued Operations Order 5, the front in the Army Group Center and South zones was still fluid. As so often happened, Hitler’s planning was based in important particulars on conditions which did not yet exist and which might not come into being exactly as he anticipated. Army Group Center was in the midst of Operation BÜFFEL. 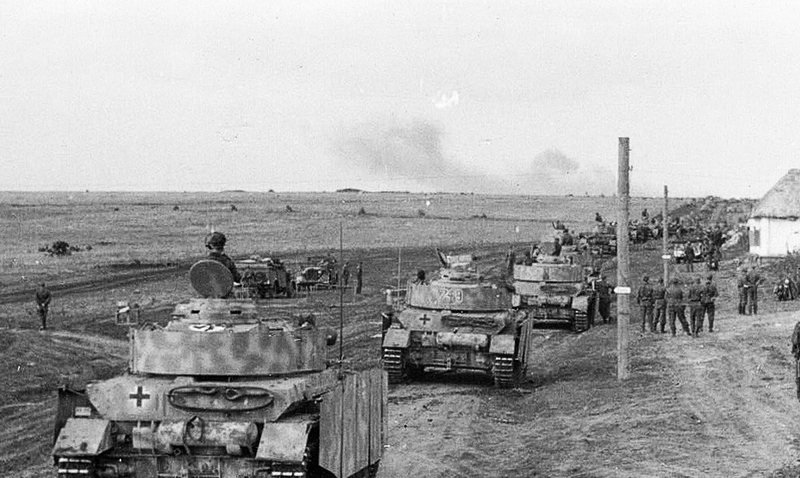 Second Army and Second Panzer Army were struggling to stop the Russians in the bulge west and northwest of Kursk. The striking force of Army Group South, Fourth Panzer Army, was adding the finishing touches to its victory at Kharkov, but it had been on the move without pause for nearly a month, and its troops were nearly exhausted. Both army groups needed time to rest and refit before embarking on an offensive. Army Group South was already feeling the effects of the spring thaw. Farther north, in the Army Group Center zone, the thaw would set in during the next few weeks and last through April. To get ready for ZITADELLE by mid-April would be difficult, maybe impossible. After Fourth Panzer Army, in the third week of March, cleared the right bank of the Donets north to Belgorod, Hitler temporarily left ZITADELLE in abeyance and turned his attention to the Donets line southeast of Kharkov. There, it appeared, the opportunity for a quick, relatively easy victory was beckoning. Frantic enemy activity east of the river showed the Russians were worried. From the German point of view a thrust across the Donets had tactical advantages. It would straighten and shorten the front southeast of Kharkov and, by pushing it farther east, might discourage the Russians from again attempting to cut off the Army Group South right flank by striking at Dnepropetrovsk and Zaporozhye. It would also facilitate the execution of ZITADELLE by eliminating the danger of a counterthrust from the south into the rear of the ZITADELLE advance. On 22 March Hitler issued an order for Operation HABICHT, an offensive thrust across the Donets, to be undertaken as soon as the river receded enough to permit a crossing. He assigned responsibility for HABICHT to First Panzer Army and Armeeabteilung Kempf. Armeeabteilung Kempf was to put one assault force across the Donets in the vicinity of Chuguyev and strike southward behind the Russian line on the river. A second force was to cross farther north and advance east to Kupyansk. First Panzer Army was to tie down the Russians around Izyum and send a force north along the west bank of the Oskol River to Kupyansk. 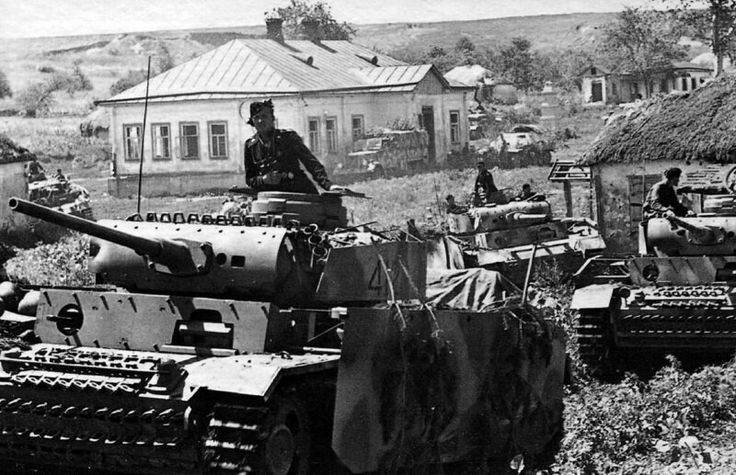 Two days later Hitler directed Army Group South also to begin planning a more ambitious operation, code-named PANTHER, to be executed by the First and Fourth Panzer Armies, which would force the Russians away from the Donets and back to the line Volchansk-Kupyansk-Svatovo-Krasnaya River. Neither of the new operations aroused enthusiasm at the headquarters of the armies concerned. The First Panzer Army and Armeeabteilung Kempf chiefs of staff worried that Hitler would fall into his old habit of driving the armies on from victory to victory without rest until, as in previous years, they again became hopelessly overextended. At the end of the month, with three operations in planning, Hitler faced the problem—which to execute and when. HABICHT was comparatively minor and would hardly be worthwhile unless it could be a prelude to ZITADELLE. PANTHER, larger and tactically more profitable, would require much more time and would necessitate an indefinite postponement of ZITADELLE. One thing was certain, every week’s delay reduced the chances of success no matter what the choice. The advantages on the German side were slight enough as it was. On the Armeeabteilung Kempf front alone the Russians had an estimated 1,000-1,500 tanks, more than twice the number Army Group South could muster in its entire zone. To achieve genuine surprise with any of the three proposed operations was already out of the question. Everything hinged on being ready to exploit the first onset of good weather in the hope of catching the enemy momentarily off guard and not solidly dug in. On 2 April Hitler issued his “decision.” HABICHT would be made ready so that it could begin on four days’ notice any time after 13 April. By placing HABICHT first on the list he had virtually eliminated it. The Donets was expected to reach the flood stage in the second half of April, and Manstein had said that Army Group South could not be ready to resume the offensive by mid-April because the panzer units would have to be allowed to complete their rest and refitting “at least to a certain degree.” Aware of those difficulties, Hitler ordered that if HABICHT could not start by 17 April, it would be superseded by PANTHER, which would then have to be ready by 1 May; if neither HABICHT nor PANTHER could be executed, he added, Army Groups Center and South would go over to ZITADELLE. Three days later Manstein told his subordinate commanders the final choice would probably be ZITADELLE. Through the winter Army Group Center stood as the bulwark of the Eastern Front, but its underpinnings were weak. Its front, projecting eastward—once a giant spearhead aimed at Moscow—was, under the influence of the second Soviet winter offensive, becoming badly eroded and an invitation to disaster. On the north flank, around the bulge west of Toropets, the army group had not had a secure line since December 1941. 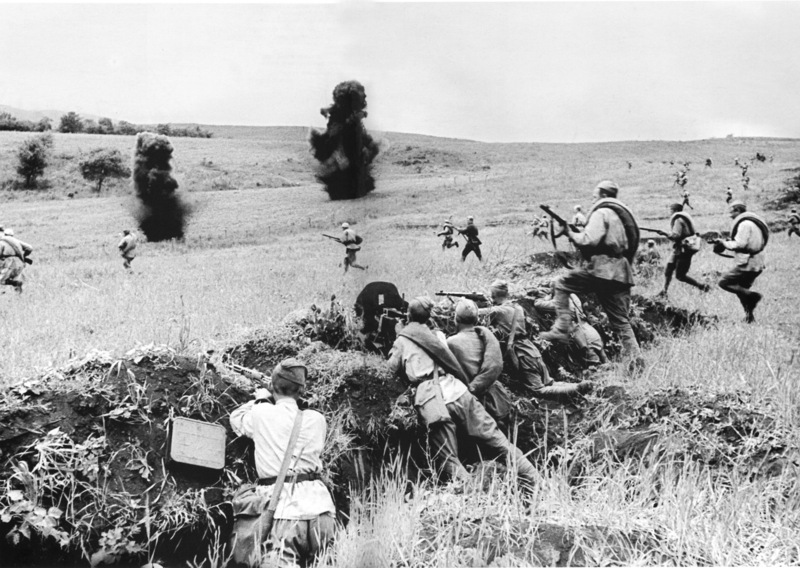 After mid-January 1943, the Soviet armies gouged deeply into the south flank, forcing it back west of Kursk. 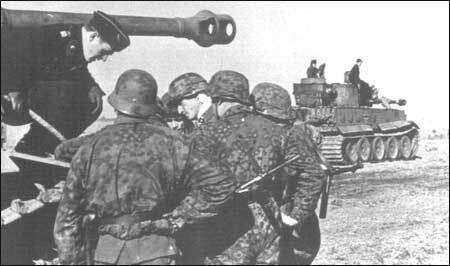 On 20 January, to shore up what was then the weakest spot in his front, Kluge moved Headquarters, Third Panzer Army, into the sector on the western rim of the Toropets bulge. The attempt to relieve Velikiye Luki had failed five days earlier. After his first look at the front, the Commanding General, Third Panzer Army, Generaloberst Hans Reinhardt, reported that the sector was in “appalling condition.” Gruppe von der Chevallerie had thrown every unit it could lay hands on into the thrust toward Velikiye Luki. In the army rear area an estimated 20,000 partisans roamed the countryside at will. The army’s first task would be to gain enough troops to establish some sort of defensible line by pulling back and sorting out the jumbled units west of Velikiye Luki. In the first week of February, having set up a line of strongpoints, Third Panzer Army turned to the partisan menace. Throughout the zones of Army Groups North and Center, partisan activity had flared up dangerously since the beginning of winter. As in the previous year, the Soviet commands employed the partisans as an adjunct to the winter offensive. Again the conditions were favorable. Hard-pressed to man the front, the Germans could only commit second- and third-rate troops in the rear areas. The Soviet victories raised the partisans’ morale and made the civilians in the occupied territory amenable to Soviet and partisan influences. Hitler, as he had since the start of the war, called for the utmost severity. In January 1943 he decreed that soldiers could not be brought to trial for atrocities committed while fighting partisans. The Geneva Convention and the rules of chivalry, he declared, had no place in anti-partisan warfare. The generals, on the other hand, were fully aware that they lacked the strength to master the partisan movement by Draconian methods and would, if they tried, only succeed in totally alienating the civilian population. Consequently, most of them attempted, for humanitarian and practical reasons, to avoid interpreting Hitler’s decree literally. The Commanding General, Second Panzer Army, General der Panzertruppen Rudolf Schmidt, for instance, directed that it would apply only to acts committed in the heat of battle and would, under no circumstances, be considered a license to kill and plunder wantonly. In late February Third Panzer Army conducted an operation (KUGELBLITZ) against the partisan center in the Surazh Rayon northeast of Vitebsk. Although it had little effect on the course of the war, the operation is worth examining for two reasons: it is representative of dozens of similar anti-partisan operations the Germans conducted in the years 1942-44, and it gives an unusually clear-cut picture of partisan and anti-partisan warfare. The area concerned, the Surazh Rayon, lay directly behind the Third Panzer Army front. It had been partisan-infested for more than a year and had won acclaim on the Soviet side for the so-called Vitebsk Corridor, where in the late winter of 1941-42 the partisans and the Red Army had maintained truck and horse-drawn supply traffic through the large gaps in the German line. By February 1943 the front had not greatly changed. The sector north of Surazh, a thin line of strongpoints spaced two to three miles apart, was held by German Air Force field divisions. In the gaps and in the extensive forests and swamps behind the front the Germans had been forced by lack of troops to permit the partisans virtually free rein. The partisans, numbering an estimated four to five thousand, were organized into brigades. They had built permanent, fortified encampments, and operated their own airfields. To execute the anti-partisan operation, Reinhardt detailed two security divisions. The first step, completed on 21 February, was to draw a skirmish line around the partisan area, which encompassed most of the Surazh Rayon. When that had been done, the troops began to advance inward, drawing the ring tighter and driving the partisans ahead of them toward the center. Contact was difficult to maintain, and the troops, pushing across rough terrain and through forests deep in snow, soon tired. The partisans, for their part, evaded pitched battles and, whenever they could, hid or slipped through the encirclement. When the operation ended, on 8 March, the army claimed 3,700 partisans killed, but it had no way of telling with certainty how many of the casualties were actually partisans and how many non-combatant civilians. As soon as the German units withdrew, the partisans reorganized and within a few months they had nearly regained their former strength. Although the Army Group Center zone was quiet in the early winter of 1942-43 except for partisan activity, its front in the long run, clearly was untenable. The army group had no reserves. Its left flank was weak and, after the collapse of Second Army, its right flank was left dangling in a void. When Army Group North secured permission to evacuate the Demyansk pocket, the great eastward projection of Army Group Center ceased to serve any, even remotely, useful purpose. To pinch off the Toropets salient was no longer possible, and no one was thinking seriously any more of an advance to Moscow. 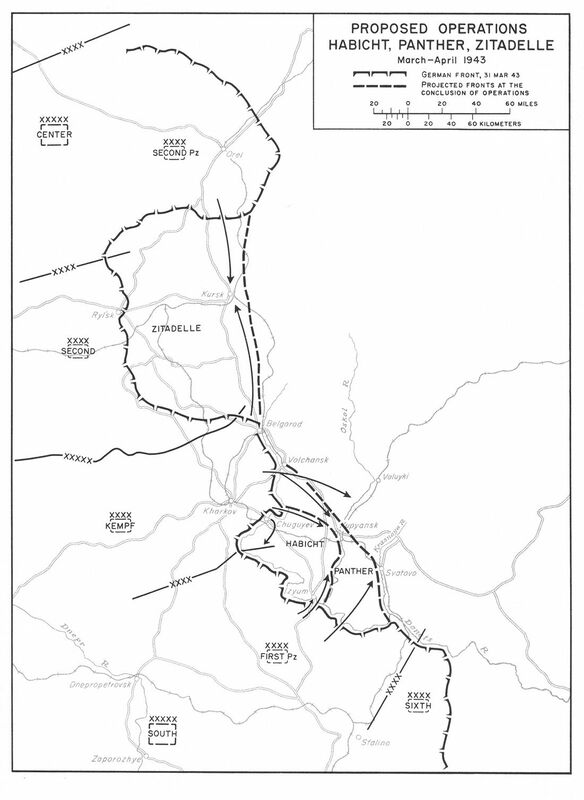 On 26 January Kluge recommended to Hitler a large-scale withdrawal that would shorten the front and eliminate the danger of the Ninth and Fourth Armies’ being encircled. As was to be expected, Hitler resisted bitterly, but finally, on 6 February, he yielded to Zeitzler’s and Kluge’s arguments. During the rest of the month the army group readied itself for the withdrawal, which was given the code name BÜFFEL. The chief task was to build a fortified line in the rear between Velizh and Kirov. At midmonth the armies began combing the towns and the countryside for able-bodied men and others who might be useful to the Russians if left behind. Long columns of evacuees, whom one army commander described as presenting pictures of absolute misery, were marched off to the west through the dead, late winter cold. Fourth Army alone reported evacuating 45,000 persons. On 1 March Ninth Army began drawing back its front north and west of Rzhev. In twenty-three days Operation BÜFFEL was completed. The units that originally stood farthest east had covered a distance of 90 miles. The length of the front in the BÜFFEL area was reduced from 340 miles to 110 miles. On his south flank, after 14 February, Kluge faced the problem of finding enough troops to halt Second Army’s retreat and to man the lengthening line of Second Panzer Army, its neighbor on the north. As the Russians advanced west past Kursk, the army group front began to bulge dangerously east of Orel. On 20 February Kluge proposed pulling back the Panzer and Second Armies to the line of the Desna River, but Hitler was through retreating. He was already at work on other plans, and before many months had passed, the names of two provincial Russian towns, Kursk and Orel, would gain renown on the Eastern Front. Attack on the Medway, June 1667 by Pieter Cornelisz van Soest, painted c. 1667. The captured ship the Royal Charles is right of centre. He, like many Londoners, was thrown into a panic by an extraordinary raid on the Royal Dockyards of Chatham, which contained in oak the defensive strength of England. Only a rusty chain and a tiny river-fort provided the last defence against invasion. That panic was shared by the government. A coastal town was captured and three capital ships and 10 lesser vessels were burnt, while around 30 vessels were scuttled and two others – including the pride and flagship of the navy, were towed away. The one-sided attack proved to be, it can be argued, the worst defeat in the Royal Navy’s history. And it vies with Majuba Hill (1881) and the fall of Singapore (1941) as the most humiliating defeat of British arms. The Stuarts, by making friends of the Spanish and French, ensured that the threat from those two rival powers would be diminished for the best part of a century. That peace was interrupted when it became clear that the Parliamentarians were winning the Civil War against Charles I. A French squadron with transports evaded the navy in the North Sea and reached Bridlington, but was then destroyed in the harbour. Cromwell’s Commonwealth was not threatened from overseas, partly because in a Europe hit by financial crisis, no power was strong enough to mount a serious challenge. That did not change much when the Stuarts were restored. But the Dutch, sometimes allies, sometimes enemies, were a different matter. During the Commonwealth, Cromwell had successfully seen off the Dutch in a war sparked by trade disputes and fought entirely at sea. The English were victorious at the Battle of Scheveningen and the Dutch were forced to accept an English monopoly on trade with England and English colonies. Cromwell sought to avoid further conflict with the Dutch Republic. The restoration of Charles II saw widespread demands at home to reverse the Dutch dominance in world trade. Charles, however, was personally greatly in debt to the House of Orange, which had lent enormous sums to his father during the Civil War. But a conflict soon developed over the education and future prospects of his nephew, William III of Orange. That dispute, which had wide implications for the royal houses of Europe, was temporarily solved, thanks largely to the diplomacy of Lord Clarendon, a favourite of the king. In 1664, the situation quickly changed when Clarendon’s enemy, Lord Arlington, superseded him as the king’s favourite. Arlington and the king’s brother James, Duke of York, the Lord High Admiral, saw the opportunity for great personal gain in a war with the Dutch. James headed the Royal African Company and hoped to seize the possessions of the Dutch West India Company. The two were supported by the English ambassador in The Hague, George Downing, who despised the Dutch. He, either falsely or over-optimistically, reported that the Republic was politically divided between Orangists, who would gladly collaborate with an English enemy in case of war, and a faction of wealthy merchants that would give in to any English demand in order to protect their trade interests. Arlington planned to subdue the Dutch completely by permanent occupation of key Dutch cities. Charles was easily influenced and became convinced that a popular and lucrative foreign war at sea would bolster his authority as king. Naval officers were hungry for promotion and fortune in a conflict which they thought would be a walk-over. Enthusiasm for war became infectious. English privateers attacked Dutch ships, capturing about 200. Dutch ships were obligated by treaty to salute the English flag first. In 1664 English commanders provoked the Dutch by not saluting in return. Many Dutch commanders could not bear the insult. English propagandists got to work, invoking the Amboyna Massacre of 1623 when ten English residents in the Dutch fortress of Victoria were executed by beheading for alleged treason, after first being tortured by a seventeenth-century version of water-boarding. Scurrilous broadsheets demonised the Dutch as drunken and profane. Pamphlets documented, without any real evidence, Dutch atrocities in the colonies. Under such a mountain of print, most Englishmen believed, in the poet Andrew Marvell’s words, that the Dutch were the ‘undigested vomit of the Sea’. Such vilification was at least partially an expression of unease with the presence of notable Cromwellians in exile in Holland. Charles had some reason to be nervous about at least the possibility of a Dutch invasion coordinated with an uprising within England. Behind such fear-fuelled bigotry was of course the time-honoured motive for war – mercantile competition. The English sought to take over the Dutch trade routes and colonies while excluding the Dutch from their own colonial possessions. Contraband shipping had gone on from English colonies in America and Surinam for a decade, and the English were in no mood to give up such revenues. The Dutch, for their part, considered it their right to trade with anyone, anywhere. They too suffered from myopic double standards as they themselves enforced a monopoly in the Dutch Indies and threatened to extend it to India, after having expelled the Portuguese from that region. Relations were decidedly tense on all fronts. James sent the Royal African Company’s Robert Holmes to capture Dutch trading posts and colonies in West Africa. With royal authority, the English invaded the Dutch colony of New Netherlands in North America on 24 June 1664, and controlled it by October. The Dutch responded by sending a fleet under Michiel de Ruyter, which recaptured their African trade posts, seized most English trade stations there and then crossed the Atlantic for a punitive expedition against the English in America. 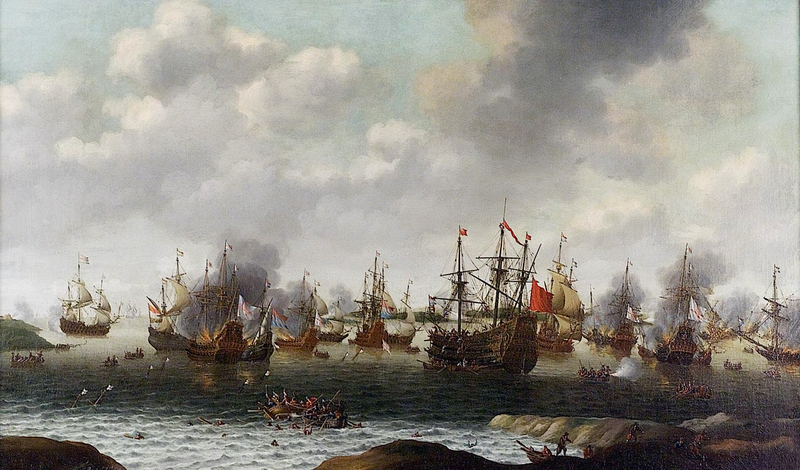 In December 1664, the English suddenly attacked the Dutch Smyrna fleet. Although the attack failed, the Dutch in January 1665 decreed that their ships could open fire on English warships in the colonies whenever threatened. Charles used this as a pretext to declare war on the Netherlands on 4 March 1665. Since their defeat in the First Anglo–Dutch War, the Dutch had become much better prepared. Beginning in 1653, a ‘New Navy’ was constructed, a core of 60 new, heavier ships with professional captains. However, these ships were still much lighter than the 10 biggest ships in the English navy. With the threat of war growing, in 1664 the Dutch decided to replace their fleet core completely with still heavier ships. Upon the outbreak of war the following year, the new ships were quickly completed, with another 20 ordered. In the run-up to hostilities, cash-strapped England could only build a dozen ships. During the course of the war the Dutch shipyards built seven vessels to England’s one. Still, on paper England appeared, fallaciously as it turned out, to be a giant facing the little Dutch boy. Her population was four times as big and its confidence was still on a par with its post-Armada period. But money was tight, with few cities able to dig deep into their coffers. The Dutch burghers were able to spend the equivalent of £11 million on the war, the English barely half that. And God seemed to have deserted England. The outbreak of war was swiftly followed by both the Great Plague and the Great Fire of London, bringing England virtually to her knees. Furthermore, the English fleet had already suffered severe cash shortages, despite having been voted a record budget of £2,500,000 by Parliament. The navy could only pay its sailors with ‘tickets’, or debt certificates, as Charles lacked an effective means of enforcing taxation. The only way to finance the war was to capture Dutch trade fleets. The first encounters were, unsurprisingly, at sea and British naval power at first seemed supreme. At the Battle of Lowestoft on 13 June the English gained a great victory. It was the worst defeat of the Dutch Republic’s navy in history. However, the English proved unable to capitalise on the victory. The leading Dutch politician, Johan de Witt, quickly restored confidence by joining the fleet personally. He sacked ineffective captains and introduced modern tactics. In August, de Ruyter returned from America to a hero’s welcome and was given supreme command of the confederate fleet. The 60-year-old de Ruyter was highly respected, even loved, by his sailors and soldiers, who used the term of endearment Bestevaêr (‘Grandad’) for him. A pious, lowly born man, cautious in his personal nature, he always led from the front and refused to back away from danger. He also, unusually for one of his standing, had an utter disregard for rank. Meanwhile, the Spice Fleet from the Dutch East Indies managed to return home safely after the Battle of Vagen. That hit English pockets hard. Charles and his ministers sought foreign help. In the summer of 1665 the bishop of Münster, an old enemy of the Dutch, had been induced by promises of English subsidies to invade the Republic. At the same time, the English made overtures to Spain. Both strategies backfired. Louis XV was greatly alarmed by the attack by Münster and the prospect of an English–Spanish coalition. He feared that a collapse of the Republic could create a powerful Habsburg entity on his northern border, as the Habsburgs were the traditional allies of the German bishops. He immediately promised to send a French army corps and French envoys. There was consternation at the English court. It now seemed that the Republic would end up as either a Habsburg possession or a French protectorate. Either outcome would be a disaster for England. Clarendon, always having warned about ‘this foolish war’, was ordered to quickly make peace with the Dutch without French mediation. Instead, he encouraged the Orangists to seize power, but that was foiled by the return of de Witt from his fleet. The Dutch created a strong anti-English alliance. On 26 January 1666, Louis declared war and days later Frederick III of Denmark was bribed into doing the same. Charles made a new peace offer, which vaguely promised to moderate his demands if the Dutch would only appoint William to some responsible function and pay £200,000 in ‘indemnities’. De Witt considered it a mere feint to divide the Dutch and their French allies. He was having none of it and decided to strike hard with a fleet of 85 ships. Eighty English ships, under General-at-Sea George Monck, the Duke of Albemarle, set sail at the end of May to confront the threat. But 20 of them under Prince Rupert peeled off to intercept a phantom French squadron believed to be joining up with the Dutch – in fact, most French vessels were in the Mediterranean. Albemarle came upon de Ruyter’s fleet at anchor on 1 June and immediately attacked the nearest Dutch ship before the rest of the fleet could come to her aid. The Dutch rearguard under Lieutenant-Admiral Cornelius Tromp set upon a starboard tack, taking the battle toward the Flemish shoals and compelling Albemarle to turn about. A ferocious battle raged until nightfall. Albemarle’s strength was reduced to 44 ships, but with these he renewed the battle, tacking past the enemy four times in close action. With his fleet in too poor a condition to continue to challenge, he retired towards the coast with the Dutch in pursuit. The following day Prince Rupert returned with his 20 ships, joined Albemarle. During this stage of the battle, Vice-Admiral George Ayscue, on the grounded Prince Royal, surrendered, the last time an English admiral did so in battle. On the fourth day the Dutch broke the English lines several times. The English again retreated, but de Ruyter was reluctant to follow because gunpowder was running low. The battle ended with both sides claiming victory, even though the English had lost 10 ships against the Dutch four. One more major action was fought – the St James’s Day Battle on 4 and 5 August ended in English victory because they lost one ship to the Dutch two. It failed to decide the war as the Dutch fleet escaped annihilation and at this stage simply surviving was enough for the Dutch. Five days later, Charles made another peace offer to de Witt using the notorious Henri Buat, a Dutch cavalry officer with a track record of conspiracy, as an intermediary. Among the letters he took to The Hague, presumably by mistake, was one containing the secret English instructions to their contacts in the Orange party, outlining plans for an overthrow of the state’s regime. Buat was arrested, condemned for treason and beheaded. His accomplices in the conspiracy fled the country to England. De Witt now had proof of treachery within the Orange movement. The mood in the Republic now turned grimly belligerent. To raise temperatures even higher, in August English Vice-Admiral Robert Holmes, during his raid on the Vlie estuary in August 1666, destroyed merchantmen and sacked the island of Terschelling, setting the main town aflame. In this he was assisted by a Dutch captain, Laurens Heemskerck, who had fled to England after having been condemned to death for cowardice shown during the Battle of Lowestoft. After the Great Fire of London in September, Charles again reduced his demands in an attempt to withdraw from the war without losing face. He was rebuffed. By the beginning of 1667 Charles’s active fleet was in a poor state owing to spending cuts and the remaining big ships were laid up. Johan de Witt saw his chance. Negotiations had been in progress at Breda since March, but Charles had been procrastinating over the signing of peace, hoping to improve his position through secret French assistance. De Witt vowed to end the war quickly with a clear victory, thereby ensuring a more advantageous settlement for the Dutch Republic. He sent his brother Cornelis to supervise the fleet’s preparations. The Dutch commanders, fearing the treacherous shoals in the Thames estuary, hired two English pilots, one a dissenter named Robert Holland, the other a smuggler who had fled English justice. Admiral de Ruyter gathered together his various squadrons and set sail for the Thames on 4 June with 62 frigates or ships-of-the-line, about 15 lighter ships and 12 fireships. The fleet was in three squadrons: the first was commanded by de Ruyter himself, the second by Lieutenant-Admiral Aert Jansse van Nes, and the third by Lieutenant-Admiral Baron Willem Joseph van Ghent. The latter, on the frigate Agatha, was the real commander of the expedition; he had done all the operational planning as he had been the former commander of the Dutch Marine Corps, the first in history created for specialised amphibious operations. That was now headed by the English Cromwellian Colonel Thomas Dolman. On 6 June a break in the fog bank revealed the Dutch task force sailing into the mouth of the Thames. The attack caught the English unawares. Despite ample warning from spies, no serious preparations had been made. Most frigates were at Harwich and in Scotland. Sir William Coventry had earlier dismissed the likelihood of the Dutch landing anywhere near London, believing that purely as a morale-booster they would launch a token attack on Harwich. That port was strongly fortified, leaving London protected by only a small number of active ships, most of them prizes taken earlier in the war from the Dutch. In March the Duke of York had ordered the discharge of most of the crews of the prize vessels, leaving only three guard ships at the Medway. The number of fireships was hastily increased from one to three, and 30 large sloops were prepared to row ships to safety in an emergency. But such measures merely underlined the lack of a clear line of command, with most responsible authorities giving hasty orders without bothering to coordinate them first. The result was utter confusion. King Charles stood aloof and English morale plummeted. English soldiers, not having been paid for months or even years, were not over-eager to risk their lives. England dithered while the main Dutch fleet took five days to manoeuvre around the shoals and reach the approaches to Chatham. At the Royal Dockyard, Commissioner Peter Pett, despite having raised the alarm, sat on his hands until 9 June when, late in the afternoon, about 30 Dutch ships, Van Ghent’s squadron of frigates, were sighted off Sheerness. Pett sent a gloomy message to the Navy Board, lamenting the absence of Navy senior officials whose help and advice he believed he needed. When decisive action was required, Pett was more interested in avoiding future blame. Van Ghent’s frigates carried marines who were landed on Canvey Island in Essex. They had strict orders not to plunder, as the Dutch wanted to shame the English whose troops had sacked Terschelling. Nevertheless, tCaptain Jan van Brakel’s crew couldn’t control themselves and commenced looting rather than soldiering. They were driven off by English militia and upon returning to the Dutch fleet found themselves under threat of severe punishment. Van Brakel offered to lead the attack the next day to avoid the penalty. King Charles was finally spurred into action and ordered the Earl of Oxford to mobilise the militia of all counties around London. All available barges were gathered to lay a ship bridge across the Lower Thames, so that the English cavalry could quickly switch positions from one bank to the other. Musketeers from the Sheerness garrison were sent to investigate reports of Dutch raiding parties on the Isle of Grain. It was only in the afternoon of 10 June that the king instructed Albemarle to go to Chatham to take charge. Admiral Prince Rupert was sent to organise the defences at Woolwich a full three days later. Albermarle found to his utter dismay that at Gravesend and Tilbury there were too few guns to halt a Dutch advance upon the Thames. To prevent such a disaster, he ordered all available artillery from the capital to be positioned at Gravesend. On 11 June he went to Chatham, expecting the backbone of England’s naval strength to be well prepared for an attack, but found only 12 of the 800 dockyard men present. Only 10 of the 30 sloops were there because the remainder had been used to ferry to safety the cherished personal possessions of senior officers, in Commissioner Pett’s case, his collection of model ships. No munitions or powder were available and the six-inch thick iron chain that blocked the Medway, installed in the Civil War to repel a possible attack of the Royalist fleet, had not been protected by batteries. Albemarle immediately ordered the transfer of the artillery from Gravesend to Chatham. Confusion reigned on the English side, as Spragge, Monck and Admiralty officials issued conflicting orders. As his artillery would not arrive soon, Monck on the 11th ordered a squadron of cavalry and a company of soldiers to reinforce Upnor Castle. River defences were hastily improvised with blockships sunk, and the chain across the river was guarded by light batteries. Pett proposed that several big and smaller ships be sunk to block the Musselbank channel in front of the chain. HMS Golden Phoenix, HMS House of Sweden, HMS Welcome and HMS Leicester were scuttled along with the smaller vessels Constant John, Unicorn, John and Sarah. Spragge took soundings and discovered that this was not enough to block the second channel, several more were sunk, including the Barbados Merchant, Dolphin, Edward and Eve, Hind and Fortune. The job was done by men from the remaining warships, which were temporarily left crewless. They were placed in a too-easterly position on the line and could not be covered by fire. Monck then decided also to sink ships in Upnor Reach, presenting another barrier to the Dutch should they break through the chain at Gillingham. The defensive chain placed across the river had at its lowest point been lying practically 9ft under the waterline between its stages, leaving it possible for light ships to pass over it. The defenders tried to raise it by placing stages under it closer to the shore. “Burning English ships” by Jan van Leyden. Shown are the events near Gillingham: in the middle the Royal Charles is taken; on the right Pro Patria and Schiedam set Matthias and Charles V alight. The positions of Charles V and Matthais, both captured Dutch merchantmen, just above the chain were adjusted to enable them to bring their broadsides to bear. Monmouth was also moored above the chain, positioned so that she could bring her guns to bear on the space between Charles V and Matthias. The frigate Marmaduke and the Norway Merchant were sunk off above the chain; the large Sancta Maria foundered while being moved for the same purpose. Pett also informed Monck that the Royal Charles had to be moved upriver. He had been ordered by the Duke of York to do this on 27 June, but as yet had not complied. Monck at first refused to make available some of his small number of sloops, as they were needed to move supplies; when he at last found the captain of the Matthias willing to assist, Pett answered that it was too late as he was busy sinking the blockships and there was no pilot to be found daring enough to take such a risk anyway. Meanwhile the first Dutch frigates to arrive had already begun to move the Edward and Eve away, clearing a channel by nightfall. Van Ghent’s squadron now advanced up the Medway on 12 June, attacking the English defences at the chain. First, Unity was taken by Van Brakel by assault. Then the fireship Pro Patria under commander Jan Daniëlsz van Rijn broke through the chain (or sailed over it according to some sources). She then destroyed the Matthias by fire. The fireships Catharina and Schiedam attacked the Charles V. The Catharina under commander Hendrik Hendriksz was sunk by the shore batteries but the Schiedam successfully set the Charles V alight. The crew was captured by Van Brakel. The flagship Royal Charles, with only thirty cannon aboard and abandoned by her skeleton crew when they saw the Matthias burn, was then captured by the Irish flag captain Thomas Tobiasz. Only the Monmouth escaped. Seeing the disaster, Monck ordered the 16 remaining warships farther up to be sunk off to prevent them from being captured, making for a total of about 30 ships deliberately sunk by the English themselves. As Andrew Marvell observed: ‘Of all our navy none should now survive, But that the ships themselves were taught to dive.’ The Dutch anchored in the Medway when the tide turned. No sooner up but hear the sad newes confirmed of the Royall Charles being taken by them, and now in fitting by them – which Pett should have carried up higher by our several orders, and deserves, therefore, to be hanged for not doing it – and turning several others; and that another fleete is come up into the Hope. Upon which newes the King and Duke of York have been below [London Bridge] since four o’clock in the morning, to command the sinking of ships at Barking-Creeke, and other places, to stop their coming up higher: which put me into such a fear, that I presently resolved of my father’s and wife’s going into the country; and, at two hours’ warning, they did go by the coach this day, with about L1300 in gold in their night-bag. … never were people so dejected as they are in the City all over at this day; and do talk most loudly, even treason; as, that we are bought and sold – that we are betrayed by the Papists, and others, about the King; cry out that the office of the Ordnance hath been so backward as no powder to have been at Chatham nor Upnor Castle till such a time, and the carriages all broken; that Legg is a Papist; that Upnor, the old good castle built by Queen Elizabeth, should be lately slighted; that the ships at Chatham should not be carried up higher. They look upon us as lost, and remove their families and rich goods in the City; and do think verily that the French, being come down with his army to Dunkirke, it is to invade us, and that we shall be invaded. The Dutch continued their advance into the Chatham docks with the fireships Delft, Rotterdam, Draak, Wapen van Londen, Gouden Appel and Princess, under English fire from Upnor Castle and from three shore batteries. Cannon boomed and musketry rattled from Upnor. 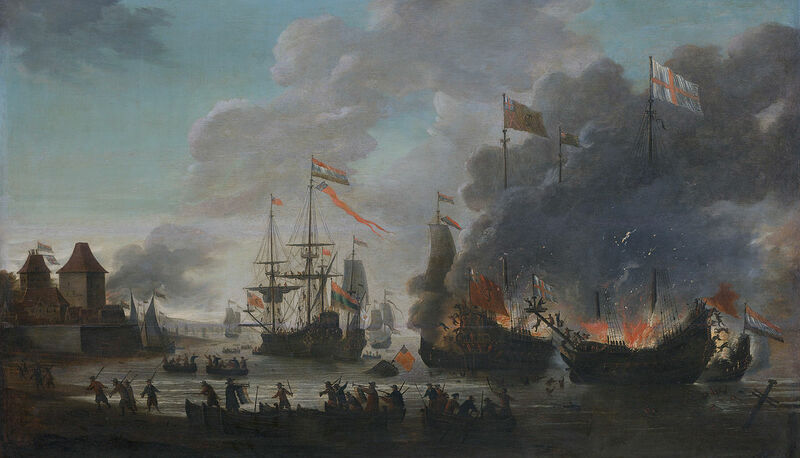 Dutch frigates suppressed the English fire, but suffered about 40 casualties in dead and wounded. The exposed structures of three of the finest and heaviest vessels in the navy, already sunk to prevent capture, now perished by fire: first the Loyal, set alight by the Rotterdam, then the Royal James and finally the Royal Oak. The latter withstood attempts by two fireships but succumbed to a third. The English crews abandoned their half-flooded ships, mostly without a fight, a notable exception being army Captain Archibald Douglas of the Scots Foot, who personally refused to abandon the Oak and perished in the flames. The Monmouth again escaped. The raid thus cost the English four of their remaining eight ships with more than 75 cannon. Three of the four largest ‘big ships’ of the navy were lost. The fourth, the Royal Sovereign, was safely but uselessly in Portsmouth. De Ruyter now joined Van Ghent’s squadron in person. Late at night comes Mr. Hudson, the cooper, my neighbour, and tells me that he come from Chatham this evening at five o’clock, and saw this afternoon ‘The Royal James,’ ‘Oake,’ and ‘London,’ burnt by the enemy with their fire-ships: that two or three men-of-war come up with them, and made no more of Upnor Castle’s shooting, than of a fly. Cornelis de Witt, fearing that the English would finally get themselves organised and counter-attack, on 14 June decided against further penetration and withdrew, towing the Royal Charles along as a war trophy; the Unity was also removed with a prize crew. Dutch demolition teams rowed to any ship they could reach to burn her down as much as they could, thus ensuring their reward money. One boat even re-entered the docks to make sure nothing was left above the waterline of the Oak, James and London; another burnt the merchantman Slot van Honingen, ruining a precious salvage opportunity. The Dutch failed to completely destroy the Chatham dockyard, another missed opportunity. Such destruction could have put back the rebuilding of the English navy by decades. The Dutch fleet, after celebrating by collectively thanking God for ‘a great victory in a just war in self-defence’ tried to repeat its success by attacking several other ports on the English east coast but was repelled each time. On 27 June an attempt to enter the Thames beyond Gravesend was called off when it became known that the river was blocked by sunken ships and five fireships awaited the Dutch attack. On 2 July a Dutch force landed near Woodbridge north of Harwich, aiming to take the port, a position of immense strategic importance. But first they had to take the newly constructed Landguard Fort. What happened next did something to restore battered English military pride. Four officers and around 100 men, with 18 heavy cannon, were determined to fight. So, too, were the town militia. Initially the Dutch fleet, due to unfavourable winds, was forced to sail north off Lowestoft before turning south to launch the attack. As they sailed northwards, the British militia, assuming another raid, marched along the coast shadowing the enemy fleet. When the Dutch turned south again, with a now favourable wind, so did the militia. De Ruyter’s fleet was joined by five troop transports sent out from Holland especially for the Harwich raid, commanded by the experienced Colonel Count van Hoorn. That took the attack force to about 850 infantrymen and 400 marines. The infantry commander was Colonel Thomas Dolman, the Medway veteran who had earlier served in the British army under Cromwell. On Sunday 30 June, 70 Dutch ships anchored behind the shelter of a large sandbank known as the Gunfleet. The landing force embarked in a small fleet of around 20 small flat-bottomed sailing barges, known as galiots, At noon de Ruyter gave the signal and the galiots started for the shore. Marines commander Colonel Francois Palm leaped out onto the gently sloping shingle, the first man to land, followed immediately by his men. To their right the infantry also poured ashore, led by Dolman. On the beach, the troops formed up as though on parade, while van Hoorn sent out a scouting party to ascend the low cliffs by a narrow track. Within two hours the Dutch were ashore safely, in good order, and without a shot being fired at them. The scouts brought back two civilian prisoners who told them that the fort’s garrison had been heavily reinforced and that 60 guns faced the raiders. Van Hoorn refused to believe them and ordered the attack. While the Dutch soldiers of the assault group moved under cover of a large sand dune at around 1400 hours, the footsore English militia were on the wrong side of the River Deben. The river was swift-flowing with a surging tidal current. The militia cavalry trotted eight miles upstream to cross at Woodbridge while the infantry crossed in a tiny ferry-boat capable of carrying barely a dozen men at a time. It was agonisingly slow work in the face of immense danger. De Ruyter ordered forward a few of his galiots, each carrying a small cannon to bombard the 250yd crossing. The part-time British militia were attempting that most difficult military manoeuvre – a river crossing under artillery fire. The crossings were halted when just a few had reached the Dutch side of the estuary. They buried themselves in marsh ditches and waited for the ebb of the tide. As the water receded, the galiots that had been plaguing them were forced farther and farther from the shore until out of range. The river crossing started again at about 1600 hours. The Dutch troops of the assault group were also forced to wait. The same tidal rush frustrated the Dutch admirals sent to bombard Harwich and Landguard Fort from the south and east. Their arrival in the selected firing positions with their squadrons coincided with the fall of the tide, and they too were forced out of range – even the largest cannon on the ships could barely reach the walls of the fort. The Dutch assault force was denied the flanking fire designed to keep the defenders’ heads down. The English had also removed all the marker buoys from the Harwich channels, so that the Dutch sailors had to navigate by memory and guesswork. Admiral van Nes’s flagship, the Delft, ran aground and had to be laboriously towed off later. The Dutch ships withdrew and most of their sailors were sent to reinforce the soldiers on land. Soon after 1600 hours – just as the falling tide allowed the militia to the north to resume their interrupted river crossing – the Dutch soldiers, marines and sailors started their attack. The soldiers were organised in 18 infantry half-companies of about 48 men each, disposed in four sections, each with four grenadiers, the rest being musketeers and pikemen. The marines were all armed with carbines – short flintlock muskets much like the old firelocks. Surprised by the sheer volume of musket fire poured at them, the vast majority of Dutch soldiers and sailors simply refused to leave the shelter of the dunes. Their musketeers, trying to fire from behind cover, tended to fire high. Some did make several gallant assaults against the walls, using their fascines to fill the ditch and their ladders to scale the walls. None made it to the top. At around 1730 the Dutch began to melt away, but officers rallied sufficient of the braver men for a second major assault. That, too, failed. At 1800 the attack on Landguard Fort was called off and the Dutch retreated towards the beaches. Part of the volume of fire which had so surprised and dispirited the Dutch troops came from a tiny galiot the British had sailed to the harbour mouth. This vessel used grapeshot to great effect on the retreating Dutch. Having run that gauntlet, Colonel Dolman’s men made it to the beach, only to confront another threat. The English militia had come together and a mixed force of 1,500 infantry and cavalry were on high ground to the north challenging the Dutch flank guard. A separate two-hour battle now ensued as the Dutch used their musketeers to keep the British at bay, with small groups of men from both sides creeping around trying to out-manoeuvre each other. The British attempred to lure the Dutch forward from their lines by feigning a withdrawal, but instead the Dutch maintained the fire of their small portable cannon, using grapeshot against the infantry and round-shot against the cavalry. This harassing artillery fire was so effective that the British cavalry were unable to form up for a charge. Sunset ended the battle. At about 2030 hours the Dutch used the deepening darkness to disengage in a display of professional skill and they were all re-embarked by around 2200. The casualties were never recorded properly by either side. One Dutch report listed ‘7 dead and 35 wounded in the whole fleet’, which does not accord with a British eye-witness account of ‘boat-loads of Dutch dead’ being rowed out to the ships. More believable is that the Dutch casualties were seven dead and 35 wounded in the ships themselves, while the soldiers and marines ashore suffered perhaps eight dead and 30–40 wounded at the fort. British casualties were very precisely numbered at the fort as one dead and four wounded, including their commander, Captain Nathaniel Darell, who received a musket ball through his shoulder. But, like the Dutch, there was no record of casualties during the withdrawal or in the battle with the enemy flank guard. The best guesses, given the nature of the battle, are 12–15 British killed and 20 wounded, and eight Dutch dead and 20 wounded. For the British it was a small price to pay for repelling the last opposed seaborne invasion of England. Despite that Dutch failure, panic still ruled in London amongst the ruling class. Samuel Pepys noted in his diary on 19 July 1667: ‘The Dutch fleete are in great squadrons everywhere still about Harwich, and were lately at Portsmouth; and the last letters say at Plymouth, and now gone to Dartmouth to destroy our Streights’ fleete lately got in thither; but God knows whether they can do it any hurt, or no, but it was pretty news come the other day so fast, of the Dutch fleets being in so many places, that Sir W. Batten at table cried, By God, says he, I think the Devil shits Dutchmen.’ And on 29 July 1667: ‘Thus in all things, in wisdom, courage, force, knowledge of our own streams, and success, the Dutch have the best of us, and do end the war with victory on their side’. Wharf official John Norman estimated the damage caused by the Medway raid at about £20,000, apart from the replacement costs of the four lost capital ships; the total loss of the Royal Navy must have been close to £200,000. Pett was made a scapegoat, bailed at £5,000 and deprived of his office while those who had ignored his earlier warnings quietly escaped any blame. The Royal James, Oak and Loyal London were in the end salvaged and rebuilt, but at great cost and when the City of London refused to share in it, Charles had the name of the latter ship changed to simply London. For a few years the English fleet was handicapped by its losses during the raid, but by around 1670 a new building programme had restored the English navy to its former power. Total losses for the Dutch were eight spent fireships and about 50 casualties. In the Republic, the populace was jubilant after the victory; many festivities were held, repeated when the fleet returned in October, the various admirals being hailed as heroes. They were rewarded by a flood of eulogies and given honorary golden chains and pensions by the States-General and the lesser States of the Provinces; de Ruyter, Cornelis de Witt and Van Ghent were honoured by precious enamelled golden chalices depicting the events. Cornelis de Witt had a large ‘Sea Triumph’ painted, with himself as the main subject. This triumphalism by de Witt’s States faction caused resentment with the rival Orangist faction; when the States regime lost power in 1672, Cornelis’s head was to be ceremoniously carved out from the painting, after Charles had for some years insisted the picture would be removed. The Dutch success in the Medway had a major psychological impact throughout England, with London feeling especially vulnerable just a year after the Great Fire. This, together with the cost of the war, of the Great Plague and the extravagant spending of Charles’s court, produced a rebellious atmosphere in London. Clarendon ordered the English envoys at Breda to sign a peace quickly, as Charles feared an open revolt. On 31 July 1667, the Treaty of Breda sealed peace between the two nations. The treaty allowed the English to keep 27 possession of New Netherlands, which they renamed New York, while the Dutch kept control of the valuable sugar plantations of Surinam they had conquered in 1667. 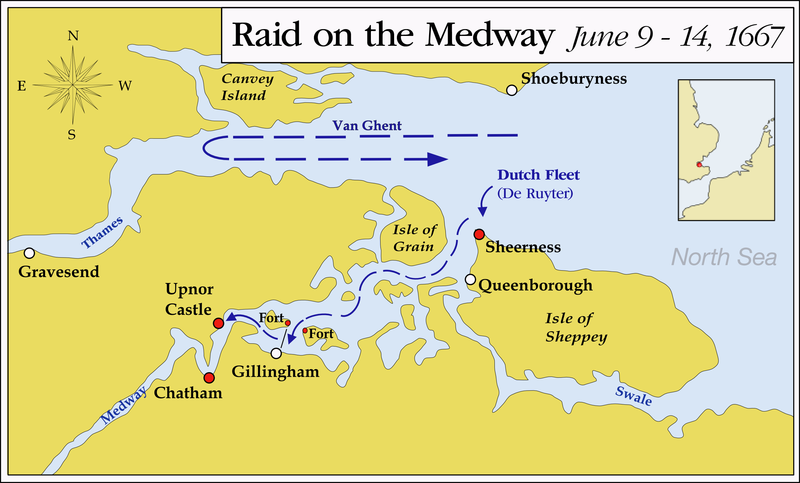 The Raid on the Medway was a serious blow to the reputation of the English crown. Charles felt personally offended by the fact the Dutch had attacked while he had laid up his fleet and peace negotiations were in progress, conveniently forgetting he himself had not negotiated in good faith. His resentment was one of the causes of the Third Anglo-Dutch war, as it made him enter into the secret Treaty of Dover with Louis XIV of France. In the nineteenth century, jingoistic British writers expanded on this theme by suggesting it had been the Dutch who had sued for peace after their defeats in 1666 – although in fact these had made them, if anything, more belligerent – and that only by treacherously attacking the English had they been able to gain a victory. The Republic was jubilant about the Dutch victory and the peace was generally seen as a personal triumph for de Witt. He consolidated his political power at home and reduced the powers of difficult provinces. But de Witt’s success would sow the seeds of his eventual downfall and nearly that of the Republic with him. Charles and Louis, both humiliated in turn, intensified their secret cooperation and would, joined by the bishop of Münster, attack the Dutch in 1672. De Witt was unable to counter this attack, as he could not create a strong Dutch army for lack of money and fear that it would strengthen the position of the young William III. That same year de Witt was assassinated and William became stadtholder. The Royal Charles, her draught too deep to be of use in the shallow Dutch waters, was permanently drydocked near Hellevoetsluis as a tourist attraction, with day trips being organised for large parties, often of foreign state guests. After vehement protests by Charles that this insulted his honour, the official visits were ended and Royal Charles was eventually scrapped in 1672. In 1676 de Ruyter took command of a combined Dutch-Spanish fleet to help the Spanish suppress the Messina revolt and twice fought a French fleet. At the Battle of Agosta a cannonball mangled his left leg. He died on 29 April 1676. He was given a full state funeral and buried in Amsterdam. The Medway debacle, a humiliation for Britain’s military might, led to a major overhaul of coastal defences. Over 15 years, enormous sums were spent in both the Medway and the Thames, and in Portsmouth, Plymouth, Hull and Tynemouth. Many fortifications were designed by the country’s famed chief engineer, Sir Bernard de Gomme. Squat forts bristling with ordnance covered the main estuaries and waterways. In military circles, the lessons were learnt and never forgotten.